Earbuds are tiny speakers for your ears, so they can put you at risk of hearing loss. 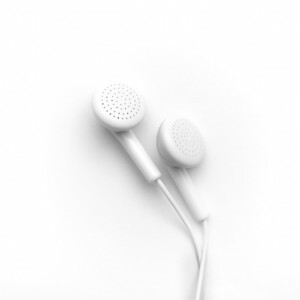 Earbuds are a convenient way to listen to your favorite tunes on the go. But did you know that earbuds have the potential to damage your hearing? Earbuds are essentially tiny speakers that you wear inside your ears. While you don’t have to ditch your cans altogether, there are a few things you should be aware of before you go blasting a rock concert in your ears. It may seem unusual because earbuds are so small, but believe it or not they can damage your ears as much as a chainsaw or motorcycle engine can. For comparison, a motorcycle engine can generate 100 decibels of sound, enough to start damaging a person’s ear after less than half an hour. Your smartphone at about 70% of its maximum volume produces 85 decibels. Prolonged exposure to very loud music or sounds can put you in real danger of hearing loss. Your ear is made up of three main parts that assist you in processing sound: the inner ear, outer ear, and middle ear. Tiny hair cells in the inner ear, or cochlea, translate sound waves into signals that can be interpreted by the brain. Loud noise damages these cells, which interferes with your brain’s ability to receive sound. And unlike damage to other parts of your body, these cells don’t heal over time. That’s why it’s especially important to take precautions when it comes to your hearing. A lot of people don’t realize that they’re suffering from hearing loss because it is gradual. You might think that your hearing is still fine after you’ve stuffed very loud buds into your ears, but consistent exposure to loud sounds gradually chips away at your ability to hear. Ringing, buzzing, muffled or distorted sounds could be an early indication that you’re suffering from hearing loss. If you experience these symptoms it’s a good idea to call your doctor. Your doctor can examine your ears and determine whether you need to see an audiologist. Audiologists are able to conduct a more thorough test for hearing loss. This entry was posted on Friday, July 8th, 2016 at 9:00 am. Both comments and pings are currently closed.